Window handles are secured by two screws. 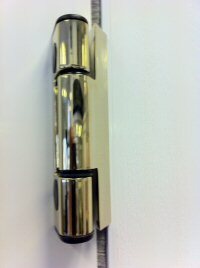 Over a period of time the handles screws can loosen and can easily be tightened. One screw is located at the bottom of the mount, when the window handle is in the open position and the other under a cap at the top of the mount. This cap can be carefully prised with a thin knife, to expose the screw. 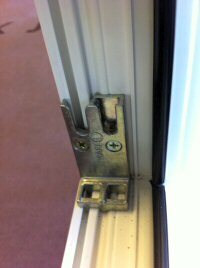 Most hinges fitted to KJM’s doors are fully adjustable, however we would recommend that our service engineer makes these adjustments as it may also require the glass re-packing. This is not a DIY job! It is recommended that you lubricate the hinges on doors and windows at least once year with a light oil (3 in 1, WD40 or similar). You should also lubricate the locking points. We recommend you wipe any excess oil with a clean dry cloth.